Fife Schools 18s are back at Starks Park tomorrow for their second SSFA National Trophy group game against Angus Schools FA. In their last outing, again at Starks, ‘team Fife’ ran out 3-0 winners against a strong Lothian Schools side. Goals were scored by Bell Baxter HS’ Owen Andrew (2) and Kirkcaldy HS’ Liam Newton. Tomorrow sees the return of Goalkeeper Ben Swinton (Bell Baxter HS), midfielders Ronan McMurchie (St Columbas) and Kyle Sneddon (Madras College) as well as striker Ryan Schiavone (Queen Anne HS) with Beath HS’ Jake Mitchell missing out due to work commitments. 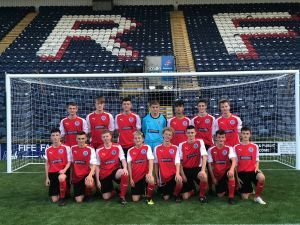 After some very positive comments from the onlooking Scottish Schools FA scouts the squad will be looking for a similar performance as we welcome Angus to the fantastic Stark’s Park surface. Team coach Gary Cunningham said “The boys were excellent in the last game, their first together as a squad. We said to them that they had done excellently well to be selected for this year’s squad and were now regarded as the ‘best school players in Fife’. We hope now that they go out and enjoy each game and use these fantastic opportunities to prove to the selectors, at SSFA, that we have very talented players here in Fife. We reiterated that there are not many better surfaces and environments for them to go on and do that. We try and allow the boys to play with a freedom and the main thing for us is that they enjoy these games and hope that they are proud to represent the schools in our region. I would love it if any parents, carers, family or former pupils could come along and support this season’s squad. Finally, on behalf of the association, I’d like to thank everyone at RRFC for allowing us to use Starks Park. We are very excited by the links we are making with the club”. The game kicks off at 1.15pm with free admission to the main stand.